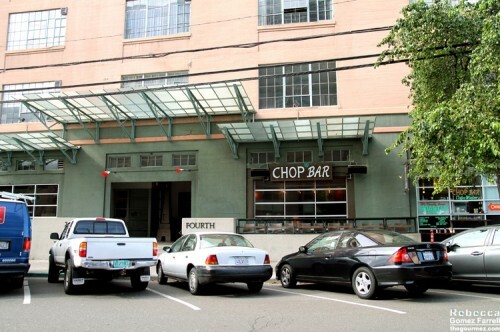 Because it blends in so well with its surroundings, Chop Bar is easy to miss in Oakland’s Warehouse district, just a few short blocks from Jack London Square. Its sage green exterior and distinctive awnings paint it as something special, though, and my brunch experience definitely confirmed that. 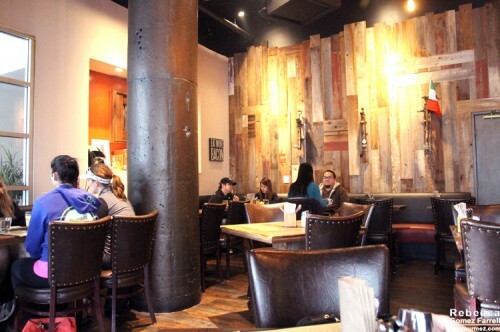 I love that sourcing ingredients locally and using reclaimed wood and fixtures is commonplace now, but Chop Bar deserves extra attention for it because their interior wood paneling was beautiful. It’s also commendable that they have a long list of their ingredient suppliers on their webpage, complete with links to those suppliers’ own sites. Nice work, Chop Bar! And nice work on the food, too. At 9:30 am, we got in just before the brunch rush. Service was mostly fine, but coffee and water refills did take a while. 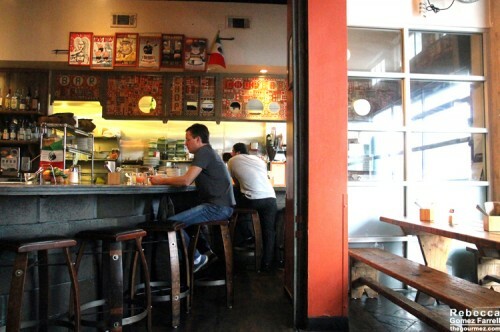 The menu offers a blend of standard Californian brunch options (eggs benedict, chorizo scrambles) and a few more unique items like the caramelized pineapple French toast and eggs cazuela with a mojo sauce. There are also sandwich and salad options, but we stuck with the breakfast foods. The standard items were prepared with a twist, especially my chilaquiles. Everyone does that dish differently, and I loved Chop Bar’s approach of folding some of the tortilla chips into the eggs so it featured both crunchy and soft tortilla chips. Those tortillas were dipped in something sticky, too, that added to their appeal. 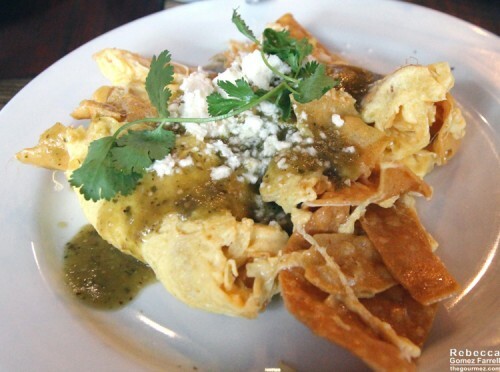 The eggs were soft and flavorful, and incorporating queso ranchero and salsa verde made it much moister than most chilaquiles. I really liked their approach. 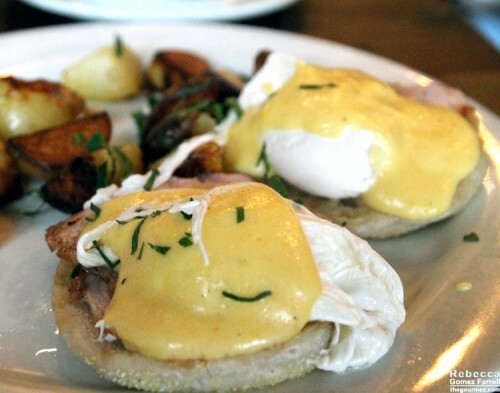 Friend #1 had the eggs benedict, also a brunch staple. Other than being made with thick back bacon, it didn’t differ in ingredients from what you’d expect. But my friend thought the poached eggs had a unique texture that she enjoyed, and she loved the dish overall. But she raved about those home fries! Friend #2 also had them and agreed they were excellent. 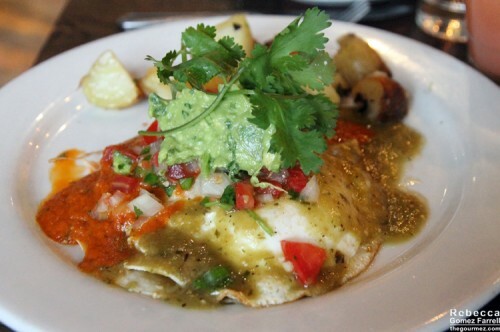 Her dish, the prettiest of the bunch, is only sometimes on the menu—huevos rancheros. The eggs were over easy and good, and the two sauces were an unexpected surprise. More attentive service would have been nice, but overall, I would definitely go back for brunch, and I appreciated their thoughtful versions of classic dishes round these parts. That pineapple french toast also needs its chance to shine…in my belly. Thanks for the company, Jay Bangle & Jessen Langley! You are entirely welcome! That was the best latte I’ve had in years!